The adults are tiny (3/8 inch wingspan) white to light grey moths with brown markings on the forewings. The larvae or caterpillars are 1/8 inch in length with a light green (sometimes with a reddish or yellow tinge) body and a shiny black head. The larvae mine out the pith of foliar tips starting in the fall and continuing during the spring. The mined tips turn at first to a translucent or straw colour, later turning brown. The damaged foliage is hollowed out and crumbles easily between your fingers, whereas winter damaged foliage does not. The mines start near the end of a branchlet in the scale-like leaves and extend into other branchlets. Cedar leaf miner damage is denoted by a sharp margin between the healthy green tissue and dead brown tissue. Injury begins in the summer and reaches a climax in the fall. Death of mined branchlets often occurs giving the tree a sickly appearance. 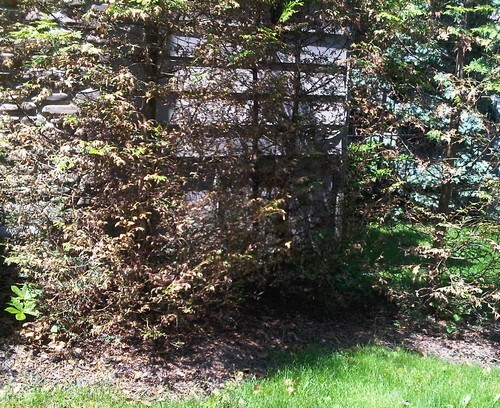 The greatest injury probably occurs to hedge rows and ornamental plantings. To find the larvae, gently tear the leaf scale along the margin between the green and brown tissue. Look for a tiny green or yellow larva or pupa in this area in the spring. The leaf miners seem to attack from the bottom up. 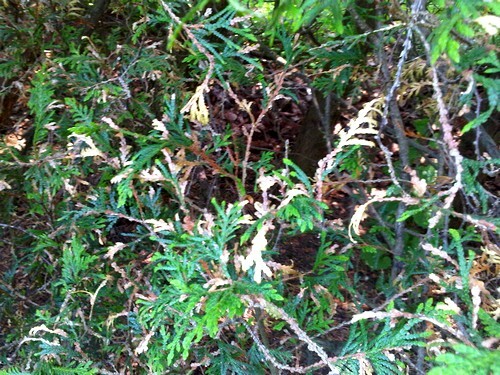 This photo shows a severely defoliated cedar. Under forest conditions, leaf miners are usually kept in check by natural control factors, including tiny wasp parasites. On ornamentals there are a few options. Systemic insecticide can generally not be used any longer. One exception to systemic insecticides- on cedars with trunk diameters of 4" or more Acecaps could be used. Control of the adults with an application during peak flights may reduce the amount of eggs laid, but since the adults are flying moths, they do not provide an easy target..